The only changes that I made to him was changing his name and dropping his second power, per some of your suggestions. Other than that his Balance, Playability, Creativity, Theme, and and Availability are all the same. Shouldn't 1 be spelled out? Have you playtested him some before you submitted him to make sure the points are close to correct? It seems to me that most Heroscape cards seem to use numerals rather than spell out numbers so I chose to use 1 rather than one. I have play tested him a few more times since my last submission and since the only play mechanic he lost was a mostly cosmetic one, I feel that 35 is still about the right price. Okay. Just checking. Good to know. I am a tad concerned about his price, but playtesting will decide that. I think this new version is an excellent improvement. I'm not sure what I think about the personality, or the General, but I'm willing to review it. 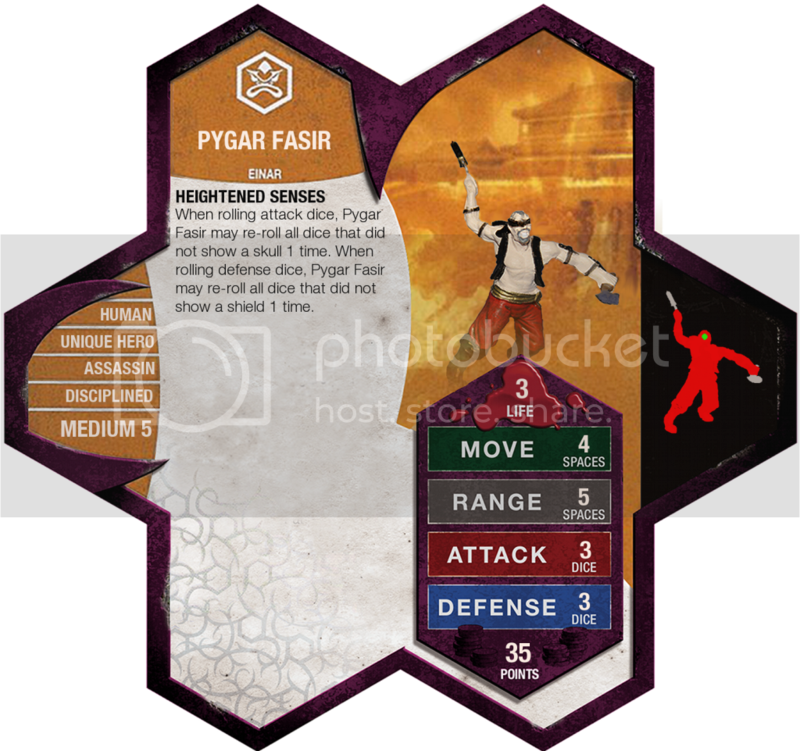 I've got a few questions about Pygar Fasir. First, are those throwing axes or knives he is holding? Second, why Einar? What would he want with a blind axe throwing assassin? Why is he disciplined? Third, if he has heightened senses then isn't he physically fit? If so then why Move 4? I like the concept and power, but I would like to know more about the details before voting to review. I second Super Bogue's concerns. It's a cool idea (though likely underpriced) but I want to know more about him. Yeah, now that I think about it, it is pretty weird for an assassin to have 4 move. Was there a reason for that choice? Well, he's blindfolded, for one. That might slow you down a bit. I could see his blindness slowing down his movement across terrain while his senses could help him target opponents and avoid attacks at close range. Hmm, I almost wish his heightened senses had a range restriction of 2 or 3. He is blindfolded, but his senses are good enough that he can dodge attacks or adjust his attacks more effectively than most people with sight. I looked at everything on that card except the move value.